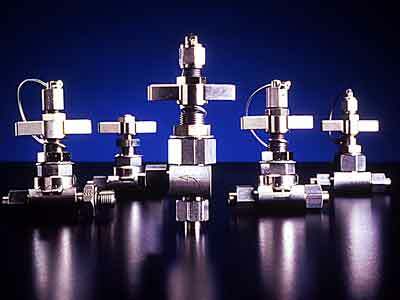 Air Dry Co. has a variety of gage valves types. The ADC® Gage Valve is designed for use in 0 to 6000 psi fluid systems. Removal of the soft seat cap allows periodic calibration of the line gage and sampling of the fluid media without shutting down the pressurized system. With the elimination of swaging on the bonnet it provides an absolute, foolproof arrangement where it is impossible to undo the bonnet or the stem during operation. Meets the latest military specification: MIL-V-24578 and proposed future revisions. Operating pressure to 6000 psig.Proof pressure 9000 psig. Maximum handle torque 50 inch pounds @ 6000 psig. Fool-proof retention of the bonnet preventing detachment normally caused by overtorquing and abuse. No extra parts such as lockwire, pins, yokes, etc. are needed. The locking mechanism is built-in and permanently attached to the valve. The stem is easily removed and may be replaced. The cap assembly is retained by a stainless steel cable for per-manent attachment and to prevent loss. Wetted parts of the valve can be supplied in monel as well as standard stainless steel. Connecting tail pieces utilize O-Ring face seals. For attachment to panels a rugged self-locking nut is supplied. Sealing is obtained with a metal seat and zero leakage at all pressures. Gage snubbers can be connected directly to valve port without adaptors. Shock tested per MIL-S-901 and vibration tested to MIL-STD-167. 6181-177-2 316 CRES ETHYLENE PROP.